There’s a lot of dissention out there lately among boxing’s fan base. Some say it’s an impossible base to please. More on that later. For the moment, let’s focus on the complaints fans are lobbing at present, such as how the best aren’t fighting the best as much as they should, and how known fighters now appear to be disinterested in true competition. These, my friends, are very legitimate gripes. Sorry, but while the UFC gives fans what they want over, and over, and over, it’s hard to be satisfied when Saul Canelo Alvarez – rightly or wrongly – tells fans how it’s going to be. Still, fans – or at least some fans – can take things a bit too far. Sure enough, some among our number tend to run over the line a bit. Sneering at the fact that Errol Spence Junior’s last fight was a ratings bonanza, for instance, strikes me as a particularly odd thing. As does aligning oneself with a particular network or promotional entity. Why not just be as objective as possible and call things as and like we see them? No one should really want a promoter, advisor or network to fail. What people should want is for these entities/ individuals to clean up their freakin’ acts when need be. One of the strangest gripes I’ve encountered lately is aimed at the upcoming Gennady Golovkin-Kell Brook middleweight title matchup. People say that Golovkin is cherry picking and that far more challenging fights can be found for the man out there. Forgive me for scratching my head, but it’s not like welterweight titlist Brook is moving up to face Adonis Stevenson here. He’s simply moving up two weight classes. It’s a challenge, sure, but isn’t that what all of us want to see more of? Of course, some will argue that they want “legitimate” challenges, rather than insane ones. That’s understandable in a world where Rod Salka got his brains jiggled around the inside of his skull by Danny Garcia in a mismatch of almost immoral proportions a few years back. Brook, however, isn’t Salka. He’s a talented, accomplished and very skilled professional athlete. What’s more, he’s doing what tons of welterweights – great welterweights, mind you – have done before him by taking a crack at middleweight glory. Sugar Ray Robinson. Sugar Ray Leonard. Thomas Hearns. Roberto Duran. Marlon Starling. These are all greats who essentially made the challenge Brook is making for himself in the here and now. It should also be noted that name middleweights aren’t exactly clamoring to face GGG. Canelo, for instance, gave up his WBC middleweight title rather than face the man. Whether or not they battle eventually or not, Canelo stepped away from a chance to face Golovkin this year and that’s a fact that can’t be effectively argued against. By the way, I’ve always felt a bit bad for Canelo in this, since it seems his main reason to challenge for the middleweight title to begin with was solely to fight Miguel Cotto. Still, he knew what he was getting into when he allowed himself to win the title as well as a decision over Cotto last year. Needless to say Canelo is simply one of numerous known entities who are arguably hesitant at best when it comes to the possibility of battling Golovkin in the ring rather than in the press. Truth be told, GGG can’t find a marquee opponent to defend his title against. 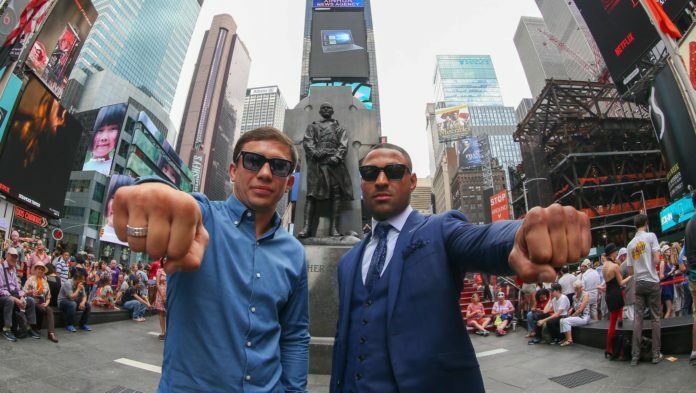 That may be a sad commentary on the state of contemporary boxing – and that it most certainly is – but there’s nothing that can be done about it. No one, for instance, can force Billy Joe Saunders, Chris Eubanks Jr and Daniel Jacobs into the ring with GGG. If they’re willing to suffer the bad publicity for maintaining the status quo then that’s pretty much all there is to it. Which, of course, leads to another point. Why is it that some fans, rather than sympathizing with Golovkin, are criticizing him for not “moving up” to fight someone else? This whole line of thinking is somewhat puzzling to me as the guy simply wants to stay at middleweight for now. What exactly is wrong with wanting to remain in one’s own weight division? At what point did that become such a terrible thing? The argument that someone has to move on to greater and greater challenges in order not to be accused of cherry picking simply doesn’t have the ring of authenticity to it. Remember that the only reason Golovkin is facing Brook is because no name middleweight really wants to face the guy. You know it and so do I. Truth be told, Brook is the biggest money fight there is for the man right now. And yeah, he deserves a big money bout…so long as that bout is legitimate, which, let’s face it, the fight with Brook is. For, although there’s a real chance Brook may get his figurative clock cleaned in England within the next few weeks, there are those who feel the man has a chance, a legitimate chance, of winning. And with good reason. Brook, after all, is a man with a true skill set. He’s big and strong for a welterweight and his straight, powerful punches are quite impressive. What’s more, Brook knows how to fight defensively and understands the importance of getting and maintaining a mental edge over one’s foe. Suffice to say, no man is invincible and if a paid professional like Brook wants to actually aspire to greatness, who can fault Golovkin for being willing to oblige? Apparently, a lot of people can. It’s worth keeping in mind, however, that such people are probably in the minority when it comes to boxing’s fan base. The internet is a truly wonderful thing, but it’s allowed chronic naysayers to spread pessimism with impunity, both in and out of the boxing world. That’s something all of us should keep in mind, for pessimism can be as contagious as optimism. Ultimately, it’s objectivity that’s needed. Perhaps there’s an argument to be made that Golovkin should be looking to move up in weight himself in order to attain true greatness, but those who make that argument should ask whether or not they hold themselves to such high standards in their own lives. Achieving greatness sometimes requires defying reason – but that’s certainly not always the case. Nor should it always have to be.